As not much cooking is happening at the moment - exam period has officially started, an update on Real Food past columns for Love Your Larder is in order. Where We Get Our Meet. 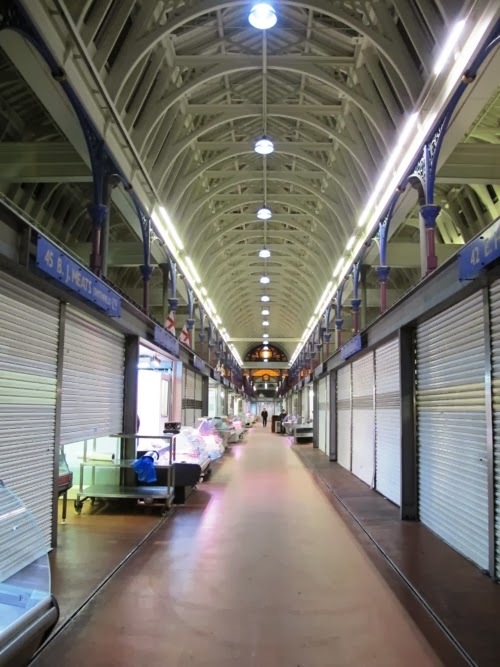 Also known as Visiting Smithfield market at 3am. Ever wondered where your meat comes from? 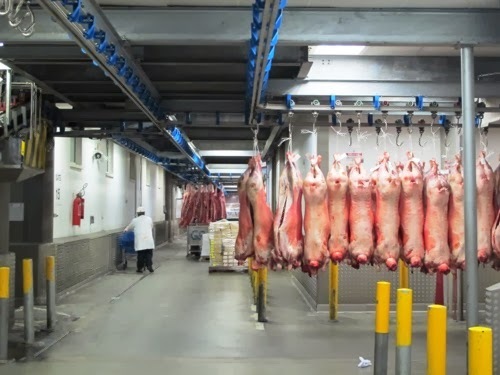 Nafsika takes a look around one of London’s biggest meat markets. “In 1174 there was a smooth field, where every Friday there took place a celebrated rendezvous of fine horses to be sold, and in another corner were placed vendibles of the peasants, swine with their deep flanks and cows and oxen of immense bulk”. 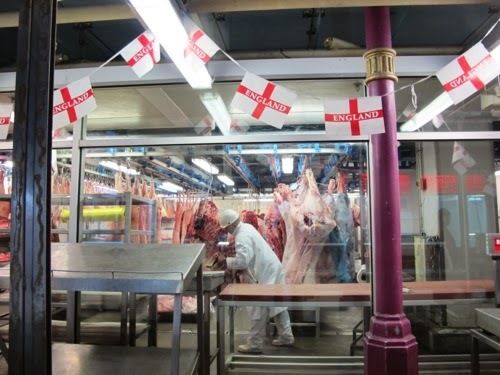 A few centuries later, on a crisp Sunday night of 2012, we set off to visit the famous Smithfield meat market, where history lies next to London’s busiest clubs, combining the old and the new in an almost mystique way. The Smithfield market was not at all what I was expecting. Having often visited the Greek central meat market I pictured a large, vibrant, loud market, with sellers yelling their prices and advertising the local origin and the (indeed) exceptionally good quality of their meat; blood and the smell of meat dominate the atmosphere; a very primitive feeling surrounds you. But this meat market was very different. It was 1am when the first well dressed men, all wearing very clean white coats started arriving at Smithfield market. Enormous large trucks appeared, with whole animal carcasses inside. The animals were carefully transported into large walk-in fridge spaces where they were neatly and carefully hanged, one next to the other. The surrounding clubs were noisy; the market was quiet, organised and clean. We walked around, feeling the history of this space. Our anticipation was rising; the market officially opened at 3am. By that time, most of the animals were cut and some of them were already packed, ready to be taken to butcheries, restaurants and office kitchens. Buyers started coming in, conversing with the sellers and loading large quantities of beef, pork, chicken and other specialty meats to their vans. Our thoughts went back to the origins of pastoralism and to the modern factory farming of livestock. As we were looking at the animals being portioned to what we very much enjoy cooking (yes, a medium-rare beef fillet may be the best food in the world), we couldn’t help but realise how vast the distance is between the animals we had in front of us, having a recognisable shape and form, and the plastic wrapped 200gr fillet which we find daily at our local supermarket or butcher. Do we know which part of the animal this piece is coming from? Do we know where this animal has been and, most importantly, how it was treated? Thinking of the whole chain of events that led to our very much loved fillet, ethical concerns are raised and our morality feels a bit pinched. Over the last few decades, the debate surrounding the ethical aspects of breeding cattle has been more and more intense. Old and new writings (The Jungle by Upton Sinclair being one of the classic books of that sort), and film documentaries raise our attention to the way animals and humans can be maltreated within the meat industry, with often severe consequences that even affect food safety. We usually imagine cows peacefully eating grass in a large farm somewhere far away. We imagine chickens running around in a coop and pigs happily rolling in mud. We go back to the images that we grew up with. 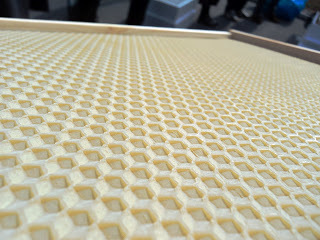 However, living in urban cities or smaller towns, most of us are very far away from these small farms and in an industry with such great concentration, where a few companies handle most of the world’s supply, the majority of meat that is being provided to us does not come from such farms. It comes from large industrial complexes of cattle farming, where the way the cows, pigs or chickens are being treated can be disturbing and destroys any illusions. We eat a piece of fillet thinking of a cow in the green field. If we were thinking of another cow, maltreated in a factory, would we be able to eat our fillet so peacefully? Where does our personal responsibility lie? Should we maybe read a bit more about livestock in farm factories? Should we maybe try and find out where this fillet is coming from and, most importantly, what was its journey? With these questions in our minds we walked around, trying also to decide if our freezer could keep a large box of chicken wings and had very interesting discussions with the sellers, who politely explained to us the different cuts and qualities of meats, offering even advice on how to best cook a rump steak. Their day was just beginning, while ours was just ending. 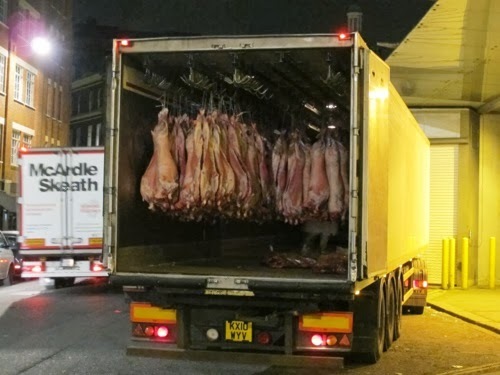 We left Smithfield market with yet another answer to our question “What is Real Food?”. Real food is ethically produced. 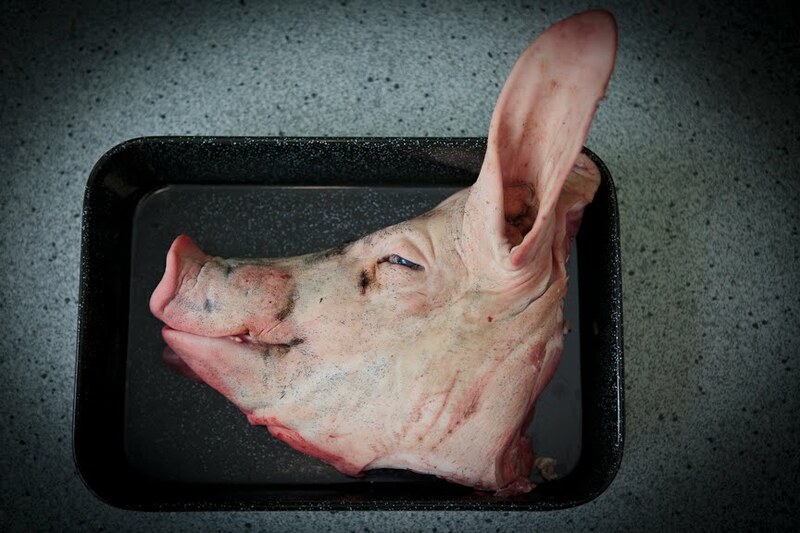 It is the meat, chicken or pork which we enjoy on a cool March evening or which we will enjoy during our summer barbecue knowing that it has been treated with respect; that we have been treated with respect. So open a book, search the web, do some research about where your meat comes from. We can suggest many places to start. Over a glass of red wine and a medium rare fillet from Smithfield market of course! 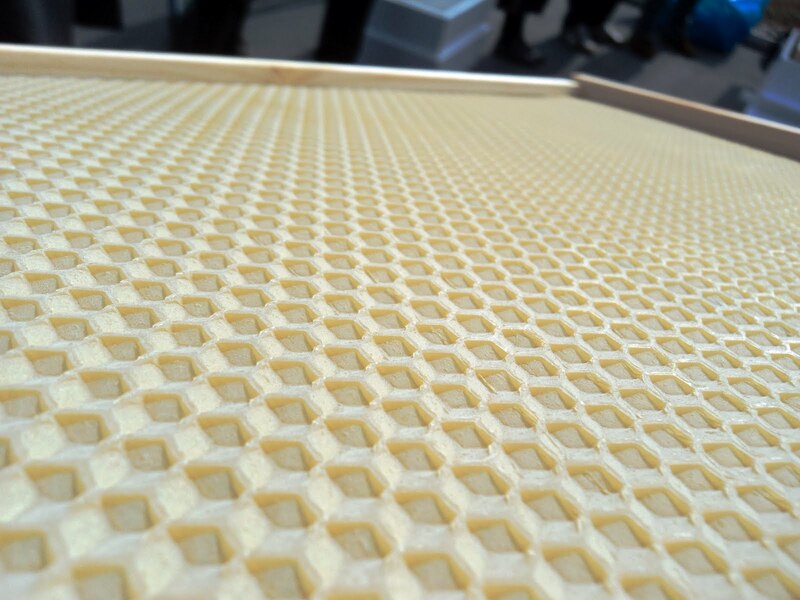 Exploring the buzz in the city. The struggle for sustainability and how to enjoy offal. Molecular Gastronomy and Ice Cream. I hope you enjoy these dear reader! Read them with a bowl of fresh, sweet strawberries and cream. That is the best thing about May after all!